Reading the Sunday Review section of the New York Times I was reminded that I always kept a sweater on the back of my chair in the summer time. I also pretty much kept the blower in the cube off. We were always playing with the blowers in the ceiling because it was just too cold. So Kate Murphy’s “Enduring Summer’s Deep Freeze” definitely resonated with me. “Being able to make people feel cold in the summer is a sign of power and prestige,” said Richard de Dear, director of the Indoor Environmental Quality Laboratory at University of Sydney, Australia, where excessive air-conditioning is as prevalent as it is in much of the United States. He said the problem is even worse in parts of the Middle East and Asia. What a waste of energy and resources! Back in 2005, the Japanese government decided to bump up the thermostats in government buildings. It took a while for what they called “Super Cool Biz” to spread. The first year, men still wore long sleeved shirts and carried jackets so they wouldn’t feel weird meeting with private sector people. A blog, GaijinPot explains what it all means. Cool biz has been a summer buzzword since the Cool Biz Campaign was launched by the Japanese government in 2005. The Cool Biz Campaign aims to help reduce energy consumption in part by having government offices and cooperating private companies set the air-conditioner to 28˚C. In addition, the campaign encouraged workers to wear cooler clothing to work, which in effect meant a more casual dress code for summer. 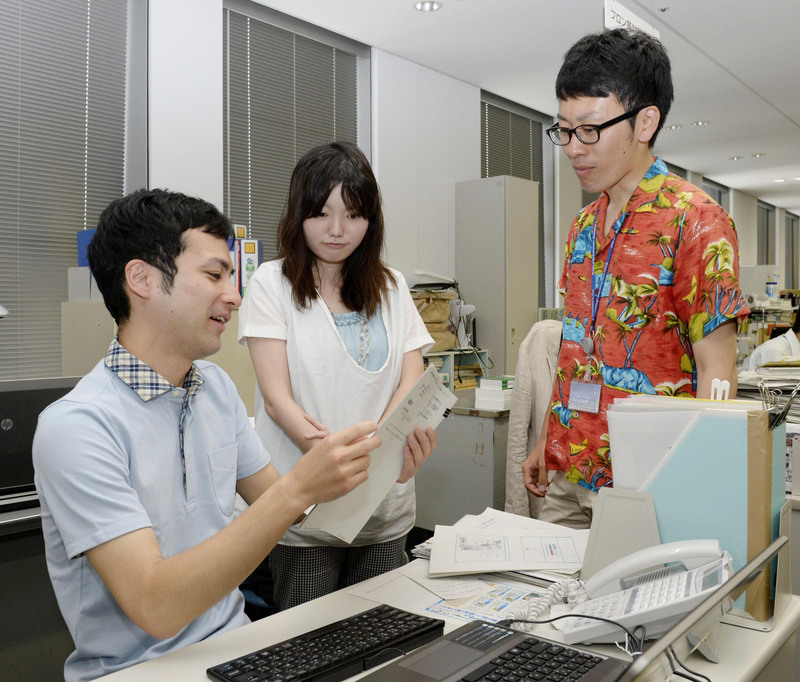 The suggested dress code Japanese government workers in the summer? Notice this is for men. I assume women can wear shirts or dresses with sandals. We already do casual Fridays many places and a lot of tech companies are casual every day so why not raise the temperature, maybe not to 82 but to, say, 78. The problem is compounded by building managers who, surveys indicate, typically don’t adjust the temperature set point higher in summertime when people wear lighter and more revealing clothes than they do in wintertime. Since thermoreceptors (nerve cells that sense temperature changes) are on your skin, the more of it you have exposed, the colder you are going to feel. Sixty-eight degrees feels a lot different if you are wearing a wool turtleneck, slacks and boots versus a poplin sundress and sandals. However, you can understand managers’ bias toward keeping the lower, wintertime setting when many are men and might wear ties and jackets no matter the season. They may be even less inclined to bump up the thermostat if they are heavyset, as body fat is the ultimate heat insulator. So, men, take off those jackets and ties in the summer. Of course, for fresh air and comfort, engineers and architects tend to agree the most effective control is being able to open and close the windows. No app required. Maybe one day we can stop dressing one way outside and another inside during the summer. A few days ago the ice cream maker, Ben and Jerry’s, offered free ice cream in exchange for a donation to whatever local charity the particular store had chosen. I posted the information on Facebook knowing that I had friends who ate Ben and Jerry’s with some regularity. A good friend (so good my wedding reception was at her house) posted a comment asking that we boycott Ben and Jerry’s because they sold ice cream to the Jewish settlements in the Palestinian Territory. I’ve been thinking about boycotts since then and this post is my attempt to think “aloud”. Looking back I can remember two successful boycotts I’ve participated in. First was the Woolworth’s boycott in sympathy to the student sit-ins. Second was the Delano Farmworkers Grape Strike. The student sit-ins of lunch counters began in 1960 in Greensboro, North Carolina. 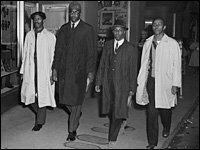 I found this NPR story about Franklin McCain and the sit-ins. On Feb. 1, 1960, four students from all-black North Carolina Agricultural and Technical College walked into a Woolworth five-and-dime with the intention of ordering lunch. But the manager of the Greensboro Woolworth had intentions of his own — to maintain the lunch counter’s strict whites-only policy. Franklin McCain was one of the four young men who shoved history forward by refusing to budge. McCain remembers the anxiety he felt when he went to the store that Monday afternoon, the plan he and his friends had devised to launch their protest and how he felt when he sat down on that stool. “Fifteen seconds after … I had the most wonderful feeling. I had a feeling of liberation, restored manhood. I had a natural high. And I truly felt almost invincible. Mind you, [I was] just sitting on a dumb stool and not having asked for service yet,” McCain says. They were not served, but returned day after day with more and more reinforcements. Sit-ins at Woolworth’s lunch counters spread across the South. In New Jersey where I grew up, there was a boycott of the local Woolworth’s in solidarity with the students. Even after the lunch counters were integrated, it was years before I had lunch at one. The first time I was in my early thirties. I still remember I had tomato soup and grilled cheese – the special. The grape boycott lasted 5 years from 1965 to 1970. Millions of Americans came to identify with the farmworkers who wanted to unionize so they could improve working conditions and wages. The United Farm Workers has a history of the strike. He knew most people couldn’t drop what they were doing and dedicate themselves completely to the movement like the grape strikers, most of whom lost their homes, cars and worldly possessions. But Cesar and the farm workers showed ordinary people that by making little sacrifices every day—by not eating grapes—they could directly help the poorest of the poor. The boycott connected middle-class families in big cities with poor farm worker families in the California vineyards. Millions stopped eating grapes. At dinner tables across the country, parents gave children a simple, powerful lesson in social justice. In my family we didn’t eat grapes for many years. My mother had been a California farmer worker and later an organizer on the east coast for the Food, Tobacco, and Agricultural Workers Union. We started boycotting very early in the strike if my memory is correct. The Woolworth’s and Farm Worker’s boycotts were successful because they were narrowly focused and concerned an issue with which the average person could identify: Segregated lunch counters and farm working conditions. The boycotts that I have been asked to join recently include Monsanto, Nestles, and Ben and Jerry’s. The first two have, in my opinion, little chance of success not because the cause isn’t clear, but because they lack focus. I couldn’t even begin to get through the list of Nestles’ products I wasn’t supposed to purchase. Organizers of the Monsanto boycott should just urge us not to purchase Monsanto’s “Round-Up”. And as for Nestles and their draining of the California (and other aquifers), people should not be buying water in bottles anyway. Better to ask people to stop buying bottled water where they can safely do so. As for the request to boycott Ben and Jerry’s, I am afraid that the issue of Israeli settlements in Palestinian territory, although of concern to me, is too obscure and not of immediate interest to most Americans who will weigh that against the other good that the company does. To succeed, corporate boycotts need to be focused in what we are asked not to purchase and concern a cause to which a critical mass of consumers can relate.